The Space Shuttle effort had a full share of optimists, with one of the more noteworthy being Francis Clauser, chairman of the college of engineering at Caltech. As a member of the Townes panel that had reviewed the space program, immediately following Nixon's election, he had written, "I believe we can place men on Mars before 1980. At the same time we can develop economical space transportation which will permit extensive exploration of the Moon." His views of the Shuttle were similarly hopeful. In May 1969, Clauser proposed that the coming decade "will see the cost of space transportation reduced to the point that the average citizen can afford a trip to the Moon." He emphasized that "when I speak of low-cost space transportation, I define low to be so low that the citizenry can afford to buy tickets for space." To achieve such a goal, he put his trust in single-stage launch vehicles burning hydrogen for high performance, and capable of routine flight to orbit. With such craft, NASA might undertake as many as 40,000 missions "before flight costs would begin to absorb a major share of its minimal budget." Was there any basis for such optimism? There was a modest but significant base of experience with existing rocket engines and with the X-15. In addition to this, experience with commercial airliners offered a set of approaches that appeared to be potentially useful. Other approaches reflected the work of design engineers, who expected to meet specifications calling for low cost. The goal we have set for ourselves is the reduction of the present costs of operating in space from the current figure of $1,000 a pound for a payload delivered in orbit by the Saturn V, down to a level of somewhere between $20 and $50 a pound. By so doing we can open up a whole new era of space exploration. Therefore, the challenge before this symposium and before all of us in the Air Force and NASA in the weeks and months ahead is to be sure that we can implement a system that is capable of doing just that. Let me outline three areas which, in my view, are critical to the achievement of these objectives. One is the development of an engine that will provide sufficient specific impulse,2 with adequate margin to propel its own weight and the desired payload. A second technical problem is the development of the reentry heat shield, so that we can reuse that heat shield time after time with minimal refurbishment and testing. At that time, when the 50,000-pound payload was still the standard, Mueller's cost goal represented a cost per flight of from $1 million to $2.5 million. This would not allow ordinary citizens to buy tickets into space, and was somewhat higher than Max Hunter's figure of $350,000. Regardless, if realized, it would be a long leap downward from the $185 million of a Saturn V.
The X-15 had already established itself as a reusable and piloted rocket airplane, with performance approaching at least that of a shuttle booster, though not of an orbiter. As program participants developed experience, they brought the turnaround time to as little as six working days. Individual X-15 aircraft could fly as often as three times a month. A careful post-flight inspection followed each mission and took about two days. Inspectors examined the aircraft closely, looking for loose fasteners, cracks, hydraulic or propellant leaks, and overheating. Technicians checked the engine system for leaks using pressurized helium. The pilot reported in-flight problems, while other problems became known through study of data from onboard instruments. These post-flight activities guided subsequent work of maintenance and repair. The engine received particularly close attention. At the start of the X-15 program, an engine run was required before each flight. In subsequent years, an engine still required a pre-flight run after replacement or major maintenance, or after three flights. A test pilot played an essential role during these engine tests, sitting in the cockpit and operating the aircraft systems. These tests disclosed such problems as rough engine operation and faulty operation of a turbine or pump, with the source of the problem being found and fixed. All aircraft systems received complete tests prior to the next flight. They also received close inspection and overhaul at stated intervals. After every five flights, the landing gear, which was under high stress, was x-rayed for cracks. Because flaps were essential for a safe landing, their gear boxes were checked for wear after every five flights as well. Stability augmentation systems, which helped to maintain control during reentry, were tested for alignment. An engine demanded major maintenance after 30 minutes of operation; it thus had a long life between overhauls, for at full thrust an X-15 would burn a complete load of propellant in less than 90 seconds. The X-15 represented one element of experience pertinent to the Space Shuttle. Another element involved the high-performance liquid rocket engines of the 1960s. The Space Shuttle Main Engine (SSME) was initially planned for 100 starts and a 10-hour life, representing a twentyfold improvement over the engine of the X-15. This long life would be essential for a low-cost shuttle, by reducing the number of costly engine overhauls and eliminating downtime due to engine changeouts and major maintenance. Although the engines of the 1960s had not been designed for long life in service, tests had shown that they already were close to achieving the requirement for an SSME. The engines of Apollo showed similar life. The F-1 was rated for 20 starts and 2250 seconds in total duration. Yet by replacing the liquid-oxygen pump impeller and the turbine manifold at 3500 seconds, test engines achieved as many as 60 starts and total durations of 5000 to 6000 seconds. The J-2 did even better, with a test engine running for 103 starts and 6.5 hours, without overhaul. This experience meant that existing engine-design practice gave a reserve of engine life that engineers could draw on in meeting SSME goals. SSME requirements, however, were far more demanding because it was to operate at much higher pressures. The chamber pressures of the F-1 and J-2 were modest by later standards: 763 and 982 psi, respectively. At full power, that of the SSME would be 3280 psi. Preburners, which fed the main combustion chamber, were to operate at pressures up to 5500 psi. In turn, these preburners received propellants from the turbopumps, whose pump discharge pressures had to be higher still: as much as 8000 psi. The turbopumps thus would face enormous stresses, produced not only by pressure but by extremes of temperature. These turbopumps would be driven by hot gases and were to pump liquid oxygen and liquid hydrogen at temperatures hundreds of degrees below zero. They had to be built as compact units - which meant that across a distance of no more than two or three feet, a red-hot turbine would be driving a deeply chilled pump. These temperatures would cause the metals and materials of a turbopump to expand and contract every time the engine was fired, and designers had to ensure that the resulting stresses would not produce cracks. Pratt & Whitney built prototypes of such pumps for both its XLR-129 and its NASA 350,000-pound engine, and Rocketdyne expected to do likewise. To deal with thermal stresses produced by the temperature extremes, designers were accustomed to using high-strength ceramics that expanded and contracted less than metals. Though hydrogen made some alloys brittle, designers  could protect them with thin coatings of gold, deposited on hot engine parts. Though this led to talk of "gold-plated engines," gold was desirable because it would not corrode. There were a variety of means to design turbopumps. Conventional ball bearings were of stainless steel, but specialized ceramics and glasses offered greater hardness and resistance to wear. It even was possible to dispense with ball bearings altogether and introduce hydrostatic bearings that relied on fluid pressure to maintain a clearance between a shaft and its housing. This avoided having parts in contact that could experience friction and wear. While hydrostatic bearings demanded a great deal of testing to ensure that they would operate properly, Rocketdyne's Robert Biggs noted that when such bearings were used on the SSME, they "worked beautifully." Other alternatives existed in the area of thermal protection for the booster and orbiter, to guard against the heat of reentry. Hot structures offered a well-established but complex and tricky approach; while tiles of matted silica fiber promised simplicity, they were in an early stage of development in 1970. There also was a third approach: ablative heat shields of light weight and low cost. In their earliest forms, such heat shields dated to the missile nose cones of the mid-1950s. They had been standard elements of the Mercury, Gemini, and Apollo spacecraft, showing particular merit on the latter, which returned from the moon by re-entering the atmosphere with twice the energy of a return from earth orbit. Ablative shields carried away the heat of reentry by vaporizing or charring in a controlled manner; hence they were not reusable. New versions, however, had densities as low as 15 pounds per square foot, matching the low weight of tiles. There also was strong interest in low-cost methods for fabrication of large ablative panels that could be installed readily and removed while covering substantial areas of a shuttle's wings and body. Engineers thus were confident that they could use such panels as an interim method for thermal protection, allowing them to get a shuttle up and flying even if development of the tiles were to encounter delays. In addition to this, while the tiles were to cover large areas, they could not cope with the reentry temperatures of a shuttle's nose and wing leading edges, which would range from 2500 to 3500 °F. For these limited regions, still another alternative was under development: carbon composites. Carbon had an excellent ability to withstand high temperatures; vanes of graphite, dipping into the rocket exhaust of the V-2, had steered that missile as far back as 1942. Being brittle, graphite was unsuitable for use in thermal protection. The new carbon composites, however, were resilient, and reusable. In 1968, with computerized checkout still off in the distance, two maintenance managers at American Airlines noted "the difficulty of quickly and accurately locating a fault in our complex airplanes. As a consequence, much of our current troubleshooting efforts are ineffective." Many aircraft components received an allotted time in service prior to removal for test or overhaul; yet over 80 percent of these "time-controlled" units did not run to their approved time limits. Regardless, it was not desirable to reduce the time between overhauls. Experience had shown that when items were removed for test or for major maintenance, they tended to fail more frequently after being reinstalled. over a recent six-month period, 44 percent of the components replaced during maintenance of the air conditioning system did not eliminate the pilot's complaint. Fifty-two percent of the replacements in the autopilot system did not eliminate the pilot's complaint. The nation's airlines thus had a particularly strong interest in computerized checkout. While NASA was quite prepared to develop its own system for the shuttle, the airlines and their contractors could offer valuable experience, while subjecting such systems to the demands of daily use in large fleets over long periods. Pan American World Airways was emerging as an industry leader in this area; in 1970, it was providing onboard fault detection and analysis for cockpit instruments and items of flight equipment. These included the radio altimeter, radio receivers used for navigation and low-visibility landings, transponders that returned a radar signal to make a plane show up brightly on a radar screen, and electrical generating systems. Pan Am was also extending the use of such airborne monitoring systems to detect faults in engines. Sensors took data on engines during flight; an onboard computer used this data to determine solutions to equations that calculated engine performance. It also compared the solutions to stored values to establish trends in performance. If a trend was unfavorable - if an engine was beginning to deteriorate - a printer on the flight deck would prepare a message and warn the crew. In 1970, a prototype had already been flight-tested aboard a Boeing 707 and was slated for similar testing on a Boeing 747. What had caused these overruns? Here too, cost meant people. Major overruns resulted when large technical staffs drew salaries to little effect, as when projects encountered technical stumbling blocks, forcing major redesigns. Such difficulties brought delays and pushed up costs by wasting much of the earlier work. Other delays stemmed from unanticipated failures,  such as the Apollo fire in early 1967; this alone accounted for much of Apollo's overrun. The Shuttle was all too likely to encounter such issues, for it offered technical challenges aplenty. Budget officials therefore were well aware that the cost estimates of the day represented estimates made at the start of a program and were subject to potentially large increases several years down the road. Even so, low-cost space flight indeed appeared feasible. In summary, people believed in this feasibility because leaders such as Mueller had identified the most promising routes to low cost: engines with high performance and long life, reusable heat shields, and onboard checkout. Experience in engine development, supplemented by a wealth of design alternatives for critical technical problems, promised assurance of a good SSME. Similar alternatives existed for thermal protection, again promising multiple routes to low cost. Major airlines, working in partnership with shuttle contractors, were already taking the lead in developing onboard checkout. Nevertheless, a question remained: Even if NASA could build its Shuttle, was it in the national interest for the agency to do this? This increasing commitment was sure to bring increasing scrutiny from the Budget Bureau, whose analysts were prepared to seek justification of the Shuttle by applying a standard economic approach. This approach relied on constant or uninflated dollars, thus making it possible to ignore the effects of inflation. Its point of departure lay in the indisputable fact that, during the 1970s, the Shuttle program would require substantial outlays of funds to pay for its development. In exchange for this, the program could hope to reap valuable savings by lowering the cost of space flight, during the 1980s. One then could ask if would not be better and more cost-effective to use the Titan III family instead. As an alternative to the Shuttle, the Titan III was already in hand, and could readily receive technical improvements that would allow it to carry heavier payloads. On a straight dollar-for-dollar basis, the answer to this question clearly was "no." The Titan III was an expendable launch vehicle, thrown away after each flight. Hence, even a modest level of space activity would give advantage to the Shuttle, for the continuing costs of Titan III production would quickly exceed the one-time-only cost of shuttle development. With the Shuttle being reusable, its cost per flight, once operational, would be minimal by comparison. The BoB, however, was not about to assess the merits of the Shuttle in this straightforward way. Instead, it insisted on the use of discounted dollars, reflecting the time value of money. To economists, this concept reflected accepted professional practice and was not a subject for argument. It stemmed  from a simple principle: the dollar of next year is worth less than the dollar one holds today, even without inflation. We apply this principle in our own personal investments, when we purchase a certificate of deposit (CD). This CD ties up money for years, and we will not buy the CD if it will merely keep that money safe for that duration, returning it with no interest earned. Similarly, we will not buy it if it only returns interest at a ridiculously low rate such as two percent per year. We insist on a reasonable rate such as six percent, or four percent after allowance for inflation. That four percent represents the true rate of return, in constant dollars. On this basis, again in constant dollars, a ten-year CD with value at maturity of $1000 will cost $675 in money we hold today. This is as much as to say that the sum of $1000, payable in 10 years, has a value at present of $675. This also illustrates that not only is tomorrow's constant dollar worth less than today's, but that money markets act to determine how much less, and to set the price of securities accordingly. In working with discounted dollars, the BoB applied a discount rate, analogous to the interest rate on that CD. The Bureau was prepared to set this rate by invoking a concept analogous to investment risk. In securities trading, it is commonplace to demand higher return on investments that carry greater risk. Thus the corporate bonds of AT&T, which are very safe and highly rated, may return no more than six percent, while bonds of riskier companies may pay over eight percent. For the BoB, the analogous concept was national priority. Many federal programs could be viewed as investments, laying out money in the short-term in hope of realizing a social or economic return in the future. Programs holding high priority - interstate highways, construction of schools and colleges - could receive a low discount rate, analogous to the low interest rate of bonds rated AAA. By contrast, programs of low priority resembled speculative investments, and demanded a high discount rate. The Bureau gave the space program a particularly low priority, and imposed discount rates as high as 10 percent. This was as much as to say that the Space Shuttle, viewed as an investment, was no better than an issue of junk bonds. The BoB's analysts were prepared to compare the Shuttle and Titan III in a variety of ways. The comparison would depend closely on the assumed  level of activity, the number of flights per year. For a given level, these analysts could determine the discount rate at which the cost of the Shuttle, in discounted dollars, would be low enough to save money. For a given discount rate, such as 10 percent, the BoB could also show whether the Shuttle indeed would be the less costly way to proceed - or whether the Titan III would hold the advantage. Such analyses, using discounted dollars, in no way amounted to a simple comparison of shuttle development cost to Titan III production cost. If the Shuttle would ever pay for itself, it would do so when operational during the 1980s, using the discounted dollars of the 1980s. Because the discount rate was high, those dollars would have little present value at the immediate moment, in 1970. Hence, the Shuttle would have to promise a discounted cash flow that would be enormous indeed. Its discounted cash savings, achievable during the 1980s and hence worth very little in 1970, would nevertheless have to exceed the cost of development, which NASA would incur during the 1970s. Hence, in dealing with the BoB, NASA was in the position of a corporation whose officials hoped to finance a major development program by issuing bonds. With the program being speculative, the bonds would feature high risk and would carry high interest. Investors then readily might fear that the company would go broke paying interest before it could realize the return from a successful program. To guard against this, company executives would have to give those investors excellent reasons to believe that the benefits from this return, far off in the future, would be large enough to be worth the wait. ....and Defense Department activity, at 15, 20, and 30 flights per year. The 15-per-year rate was close to the current DoD level; the high rate was twice this level. The analysis showed that at the lowest level of activity, averaging 28 flights per year, the Shuttle would barely compete with the Titan III even on a straight dollar-for-dollar basis, without discounting. The Shuttle would save only half a billion discounted dollars, and would break even with the Titan III at a discount rate of only 1.5 percent. This was as if a Las Vegas hotel and casino, a speculative venture if ever one existed, were to try for a loan with interest at 1.5 percent. If the Shuttle had to do this, it would not fly. The Bureau's analyses carried a thoroughness that could put a tax audit to shame. Nevertheless, its analysts would give NASA full opportunity to argue in favor of the Shuttle, and particularly of the two-stage fully-reusable configuration that now was this agency's heart's desire. In doing this, the BoB would repeat the experience of 1969. 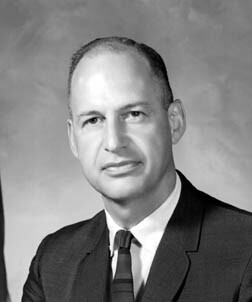 Its director, Robert Mayo, had given Paine free rein to develop the post-Apollo plan of his dreams and even to see it endorsed by the Space Task Group, largely without change. Then Mayo had lowered the boom, cutting NASA's budget and putting that plan out of reach. His colleagues now were ready to give NASA similar leeway during the studies of 1970, amid a general awareness that their budget axe was close at hand. This, however, represented a retreat toward viewing the Shuttle once again as a vehicle for use in space station logistics. During 1969, the Shuttle had gained considerable headway through a different approach, which had presented it as the linchpin of a program of automated rather than of piloted spacecraft. Lindley saw that he could provide a more convincing justification by extending this approach. He asserted that the Shuttle could achieve additional cost savings not only by reducing launch costs, but by cutting the cost of the payloads themselves. Lindley proposed that the availability of such inexpensive payloads could stimulate new uses for space, encouraging satellite contractors to build more such spacecraft. The Shuttle could thus promote the growth of its own traffic, for it would carry not only the planned payloads of 1970 but many others besides. The Shuttle then might repeat the experience of commercial aviation, which had achieved vast growth by cutting the prices of its passenger tickets. ....imposed by the restricted capacities of that era's launch vehicles. Because there was no way to recover a failed satellite for study, much effort went into extensive ground tests that could assure reliability. Quality assurance demanded extensive documentation, to assure that engineers could use limited data from telemetry to trace and recreate the cause of an in-flight failure. To cope with such a failure, the project staff had to remain on call, drawing salaries all the while. A large technical staff would also be necessary to assure success, conducting extensive pre-launch checkouts and then working with the spacecraft after it reached orbit. The Shuttle offered a completely different outlook. Already its capacious payload bay was promising to ease restrictions on weight and volume. To Lindley, this meant that the electronics of future spacecraft might be packaged in modules mounted in racks, having standard connections for power and  data. Like the cockpit instruments of Pan Am with their provisions for onboard fault detection, these modules would indicate their health to the Shuttle flight crew. Satellite checkout would occur after reaching orbit, not on the ground. Astronauts would locate problems using the satellite's fault detection system, removing faulty modules and replacing them with spares. A satellite also would incorporate other systems: solar panels, power conditioning, attitude control, and data and telemetry. These could also receive on-orbit checkout. In addition to this, because they would provide standard functions, they could be built to standardized designs. They would take shape as additional modules, listed in a catalog. 1. Full scale development of a fully reusable space shuttle. 2. Develop a hybrid system with a reusable spacecraft and expendable booster. 3. Develop a fully expendable low-cost launch system. 4. Continue to rely on the current family of launch vehicles or improved versions of these vehicles. Lindley had this group of people from all over Headquarters, and he was drawing from people their estimates of "How much could be saved?" He was an extremely charming and extremely shrewd man who was getting out of this group of people a set of numbers for what the economics of the shuttle might be downstream. I mean, people would object about "This is not knowable, or if it is knowable, we don't have the information yet; we would have to do a study." But he really charmed them and said, "Hey, you know, let's just get an estimate." Lindley knew that he needed more than arm-waving. He required an assessment of payload effects by an aerospace corporation with actual experience in building spacecraft. He wanted "mission models," projections of the specific spacecraft, and payloads that the shuttle might carry, and he needed such mission models for the Air Force as well as NASA. The BoB also encouraged him strongly to have the economic analysis - including the vital  determination of discount rates - conducted by professional economists with experience in this area. He proceeded to set up a series of studies. For mission modeling and for payload and launch vehicle cost estimates, he turned to the Aerospace Corp., which had strong ties to the Air Force and was widely known as a center of expertise. Lockheed, builder of the Corona spacecraft, took charge of work on payload effects. For the overall economic evaluation, which these other contracts would support, Lindley followed recommendations from the BoB and approached the firm of Mathematica, Inc., in Princeton, New Jersey. In addition to analysis that might justify NASA's Shuttle, BoB officials also wanted further studies of alternate shuttle configurations. Though NASA might be ready to push ahead at full speed with a detailed study of two-stage fully-reusable designs, as early as February 1970, agency officials assured industry representatives that NASA would pursue other concepts as well. These might offer lower development cost, or reduce the outlays in the near term. In mid-May, NASA awarded the main Phase B contracts to North American Rockwell and McDonnell Douglas. The chairman of Grumman, a losing bidder, responded with a vigorous protest. In phone calls and meetings with NASA officials, he stated that he opposed NASA's preferred shuttle concept, that the Request for Proposal had been faulty, and that NASA's decision was tantamount to declaring that Grumman would have to get out of the  business of piloted space flight. He also complained that Grumman lacked strong support from the senators of New York, its home state, and that the company's top executives lacked rapport with their NASA counterparts. Paine's colleagues responded in kind, noting that selection of contractors was not a popularity contest and adding, frankly, that in its technical aspects, Grumman's proposal had been the worst of the four received. At the same time, NASA was ready to supplement the main Phase B contracts with additional Phase A studies of alternatives. Grumman walked away with the largest of these, funded at $4 million. This company had a strong background in piloted space flight, having built the lunar module that had carried Apollo astronauts to the moon's surface. Grumman did lack experience, however, with large rocket stages. Its management redressed this deficiency by teaming with Boeing, which had designed and built the first stage of the Saturn V. This team was potentially as strong as that of North American Rockwell or McDonnell Douglas. The Grumman/Boeing alternatives included the use of expendable propellant tanks, in the fashion of Lockheed's Star Clipper. They also included several approaches to phased development, whereby an initial version of the Shuttle would fly with interim systems. Rather than use the SSME for the main engines of both stages, a two-stage fully reusable shuttle might use a different engine, Rocketdyne's J-2S. This was a simplified version of the standard J-2, with its thrust increased to 265,000 pounds. Though, at 14,030 feet per second, its exhaust velocity would not match that of the SSME, it still was 2.6 percent higher than that of the standard J-2, representing a modest but useful increase. The Phase B contracts, initially totalling $34 million, reflected NASA's hope that the detailed study of vehicle and engine designs could lead relatively quickly to award of contracts for Phase C and D, covering mainstream design and development. NASA would fulfill this wish for the SSME by granting its development contract to Rocketdyne in July 1971. The agency hoped to choose a single main contractor for the Shuttle itself soon afterward. Under the spur of questions from the BoB, however, NASA now would give the Shuttle an unusually close level of scrutiny. Its economic analysis would go beyond standard cost-benefit analysis, with its emphasis on discounted cash flows, by introducing the new topic of payload effects. This topic, with its promise of sweeping changes in methods of satellite development, promised to broaden anew the significance of the Shuttle. Studies of alternative designs would go beyond the earlier issue of reducing development cost while accepting higher operational cost. These studies would now include phased development, with the prospect of treating the shuttle effort as three separate projects - booster, orbiter, SSME - that might go forward in a sequence rather than simultaneously. The resulting program stretchout then might allow NASA to proceed with the Shuttle while fitting its year-to-year costs within a tight budget ceiling. The BoB saw considerably more far-reaching changes that grew out of a revamping within the Executive Branch. Nixon had a strong interest in management and policy development; in April 1969, he set up an advisory council to recommend changes within the White House that could enhance its effectiveness in these areas. During the following year, his personal experience stimulated his desire for change. As Vice-President under Eisenhower, and now as President, he had worked with the National Security Council (NSC), which had dealt in an orderly fashion with contrasting recommendations from the Pentagon, the State Department, and the intelligence agencies. Nixon felt the lack of any similar institution to coordinate policy in domestic affairs. In March 1970, he announced his decision. He would set up a Domestic Council within the White House, as a Cabinet-level counterpart of the NSC. Its membership would include the Vice-President as well as nine Cabinet  secretaries. Nixon chose his assistant John Ehrlichman to direct it, thus giving him power on a par with that of Henry Kissinger, the National Security Advisor and head of the NSC. Nixon also proposed to reorganize the BoB, to strengthen an emphasis on management while enhancing its activity in program evaluation and coordination. The BoB would also receive a new name: the Office of Management and Budget (OMB). In Nixon's words, "The Domestic Council will be primarily concerned with what we do; the Office of Management and Budget will be primarily concerned with how we do it, and how well we do it." The BoB had long since established itself as an elite group within Washington. Its responsibilities covered the whole of the federal budget, with its myriad of programs and agencies. Yet the BoB staff rarely numbered more than 550, with some 350 being professionals, many with two or more college degrees. They stayed away from the media; they were not a good source of leaks. Veteran staffers, proud of the BOB's small size and central responsibilities, viewed themselves as unique. They said that if an army of Martians marched on the Capitol, while everyone would flee to the hills, the BoB staff would stay behind and prepare for an orderly transition in government. Robert Mayo, head of the BoB, did not stay on. He had worn out his welcome by interceding in the shaping of the Pentagon budget, which Nixon had sought to develop through talks with only Henry Kissinger, the Joint Chiefs, and the Secretary of Defense. John Ehrlichman would recall that "Nixon felt that he understood enough of the general budget process that he didn't need Mayo. Nixon just froze him out. And he also just plain didn't like Mayo." The new OMB had plenty of clout. Mayo's successor, George Shultz, had been Nixon's Secretary of Labor. After taking over as head of the OMB, he received an office within the White House itself. He started work on July 1, 1970, the day the OMB formally came into existence, and quickly emerged as one of Nixon's closest intimates. On December 7, late in the evening, Low received a phone call from Donald Rice, an OMB assistant director. Rice said that NASA would receive outlays of $3.206 billion, less than Shultz's mark of four months earlier, with new  obligational authority of $3.283 billion. The latter represented the request for appropriations that Nixon would send to Congress. Apollo 17 remained in the budget, while NERVA would survive with support from key senators. The Shuttle, however, took a heavy hit. The FY 1972 budget provides for proceeding with the development of a space shuttle system. Detailed design and development of the shuttle engine - the longest lead time component - will be begun in FY 1972. Airframe design and development will proceed on an orderly step-by-step basis leading to detailed design or initiation of development during FY 1972 depending on progress in studies now underway. A. Making no commitment to proceeding with the development of the entire shuttle system. B. Making no commitment to an FY 1972 decision on initiation of development of the airframe. Rice's phone call of December 7 did not mark the end to the budget negotiations. In Nixon's formal budget, late in January, NASA received another cut. It now was slated for $3.271 billion in new obligational authority. The only hopeful note was that at least this matched the $3.269 billion appropriated for FY 1971, with no allowance for inflation. NASA, however, was to set aside over $100 million of this to spend in future years; its outlays were to total only $3.152 billion. The Administration's intention to keep NASA on a tight leash was reemphasized as the agency received a new Administrator, James Fletcher. Fletcher had been president of the University of Utah. While his predecessor, James Webb, had spent much of his career as a high-level Washington apparatchik, and while Tom Paine had been a research manager at General Electric, James Fletcher brought hands-on experience in aerospace development. During the 1950s, he had headed a guidance-system group at the firm of TRW when that company had provided a technical staff that had managed the development of the Air Force's major missiles: Atlas, Titan, Thor, and Minuteman. The aerospace industry was well aware of the leadership that had come out of the Navaho missile program at NAA: NASA's Dale Myers, Paul Castenholz of the SSME, and Sam Hoffman who had been president of Rocketdyne. TRW had produced leadership that was even more stellar, for this company's Air Force work had placed it at the center of the nation's most important military efforts. Mayo's letter of March 18, which directed Paine to compare the merits of four alternatives, set a date of May 1 for an interim report. With a week to spare, Lindley concluded that economic criteria showed that the fully-reusable shuttle was best. It would cost the most to develop, but even when using discounted dollars, its low cost per flight would yield the largest savings. The report ranked the other choices in order: a new low-cost expendable booster, a partially reusable shuttle, and continued use of current expendables. In sum, NASA's preferred design offered the greatest advantage, but anything would be better than the expendables that represented current practice. This interim report impressed officials at the OMB; it also drew favorable attention at Mathematica. Early in July, representatives from that firm met with counterparts from NASA and OMB. Pending further study, initial results from Mathematica's analysis proved to agree with those of Lindley's interim report. In mid-August, NASA sent a second report to OMB, in which the ranking of the alternatives again was unchanged. This new report asserted that payload effects would lead to larger savings than reduction in launch costs. In a bold ploy to remove the bothersome distraction of alternate designs, the report presented the fully-reusable Shuttle as the ultimate goal. Therefore, the "hybrid (partially reusable shuttle) has been dropped from contention." Designers expected to launch the Shuttle using the Apollo facilities at Cape Canaveral. Those facilities were alive with activity during 1971. Visitors came away with a strong conclusion: This is not the delicate precision of a laboratory; this is heavy industry. The centerpiece was the Vehicle Assembly Building, one of the largest structures on the planet, with nearly eight acres under roof and an enclosed volume of close to five million cubic yards. It had four bays, each with a door as tall as a 45-story office building, and each able to accommodate a complete Saturn V - or a shuttle. 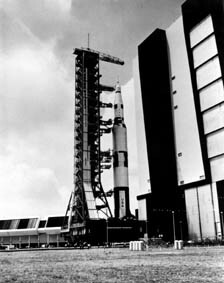 ....Tower, a massive steel platform carrying a red-painted tower with arms that would connect to the shuttle. Next, an orbiter would go onto the booster's back. A crawler, a diesel-powered vehicle weighing 3000 tons, then would move beneath the platform and lift it to ride atop a flat surface the size of a baseball infield. Eight tractor treads would begin to clank, each 40 feet long and 10 feet high. The entire array - crawler, platform, tower, booster, orbiter - would make its way through the immense door. The crawler would proceed down a roadway paved with crushed rock and resembling an interstate highway, with two sets of lanes divided by a median. That entire roadway, however, would serve the crawler alone, with those divided sections accommodating the crawler's widely-separated treads. The crawler would head for a launch pad, three miles away, and in this fashion the Shuttle would set out for orbit at the speed of those treads - one mile per hour. The Aerospace Corp. received wish lists from NASA, the Air Force, and from the commercial Communications Satellite Corp., describing the payloads these agencies hoped to launch during the years 1978-1990. It is  difficult to characterize those payload lists as reflecting more than wishes, for while these agencies had some sense of what they hoped to do during the 1970s, the 1980s were too far off for serious attention. Nevertheless, although NASA and the Pentagon were subject to year-to-year funding approvals, their planners blithely proceeded to describe what they hoped to be doing some 20 years in the future. The ensemble of these lists defined a baseline mission model, with each individual payload described in at least an introductory fashion. Each payload had an estimated weight which Aerospace Corp. analysts used as a basis for work that would compare the Shuttle to alternatives calling for expendable launch vehicles. Based on its weight, each payload could be assigned to a particular rocket having a known launch cost, such as a Delta or Titan III. These analysts also determined a cost for each payload by using "cost estimating relationships," which drew on historical data. These relationships gave good approximations of the actual costs of existing spacecraft and satellites, which served as benchmarks. .....attention of the OMB. Aerospace Corp. presented its findings in undiscounted dollars, leaving the discounted cash-flow analyses to Mathematica. Even so, these findings were valuable, and revealing (above). Current expendables would also require funds for research and development, to enhance their capabilities. Their launch facilities would receive their own enhancements. Nevertheless, even with an extraordinarily generous mission model and with undiscounted dollars, the Shuttle would fail to pay its way - if one considered launch costs only. The large size of the mission model would amplify the substantial difference between recurring launch costs of the Shuttle versus those of expendables. Still the high cost of shuttle development and procurement, some $12.8 billion, would swamp these savings derived from lower launch costs, to give the current expendables a strong advantage. Payload effects promised to change this picture dramatically. These effects promised modest but welcome reductions in the cost of payload research and development. They also promised savings of some 50 percent in payload recurring costs, which represented the largest single item in all three space programs. As a consequence, when one extended the comparisons to include payload costs and not merely launch costs, the Shuttle-based space program gave a projected saving of as much as $14 billion when compared to a program based on current expendables. A year-by-year comparison showed that the Shuttle would operate at a strong financial disadvantage between 1971 and 1977, for it would incur its cost of development during those years. As early as 1979, however, the Shuttle-based program would show a billion-dollar saving in annual outlays, due to payload effects as well as lower launch costs. That advantage would top $2 billion per year during most of the following decade. In discounted dollars, the heavy outlays of the 1970s would be equivalent to money borrowed at an interest rate of 10 percent. The savings of the 1980s then would amount to repayments of these borrowed sums, with interest plus principal. Using discounted cash flow, however, it would not be necessary for the Shuttle to show an advantage of $14 billion. It would suffice if the Shuttle could break even. Its $14 billion in undiscounted savings then would amount to the total of interest paid on the initial borrowings. Put another way, that $14 billion would provide a cushion, ensuring that the Shuttle would save enough discounted and therefore less-valuable dollars  during the 1980s to repay in full the more-valuable dollars that would pay for its development during the 1970s. At Mathematica, analysts led by the economist Klaus Heiss considered a broad range of mission models. They did not treat only the baseline model with its 736 shuttle flights, but examined other models that called for from 500 to 900 shuttle flights, again between 1978 and 1990. In addition to this, they carried through two types of economic analysis. "Equal capability" analysis, using discounted dollars, assumed that a particular mission model represented the whole of the nation's space activity, with shuttle and expendables launching the same payloads and therefore having the same capability. In this view, the economic benefits of the Shuttle would consist entirely of cost savings, due to both launch cost reductions and to payload effects, in flying this standard set of missions. The table, "Costs of Three Space Programs," gives an example of an equal-capability analysis, in undiscounted dollars. This type of analysis could be described as highly conservative, for it ignored the likelihood that with the Shuttle chopping the cost of space activity, government and commercial agencies would seek to do more in space. The second type of economic analysis, "equal budget," addressed this issue. It took the view that total space spending would stay the same, even with the Shuttle bringing lower costs. Shuttle-derived cost savings then would not represent cash returned to the United States Treasury, but instead would pay for additional spacecraft and their Shuttle flights. In turn, those additional missions would have economic value, and Mathematica could estimate what this value would be. Equal-budget analysis captured the cost savings of the equal-capability case. It asserted, however, that the Shuttle's economic benefits would also include the value of those additional payloads, with the Shuttle spurring the growth of its own traffic. This type of analysis broadened the Shuttle's economic rationale - and increased the cost that the program could incur for development and procurement, while still breaking even through discounted cash flow. The work of Mathematica was brilliant. If its sole purpose had been to allow one of Klaus Heiss's graduate students to win a PhD, it would have succeeded magnificently. At the OMB, however, key people hardly believed a word of it. ....and evaluation. Those capabilities had long been present within the BoB; NASA's James Webb, who had headed the BoB during the Truman years, often said that "its name conceals its function." Under Lyndon Johnson, the BoB included an Office of Program Evaluation. Newly strengthened, its counterpart within the OMB became the Evaluation Division, with the economist William Niskanen as its director. 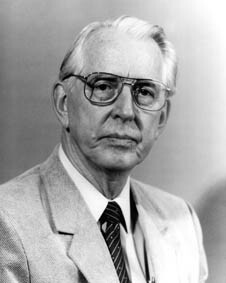 Niskanen, from the University of Chicago, counted himself as a disciple of the economist Milton Friedman, a leading advocate of the free market and a strong critic of government programs. Niskanen himself went on to build a  reputation as a supporter of tax cuts, heading the libertarian Cato Institute. He did not love the Shuttle in 1971, and his criticisms were blunt. He dismissed out of hand the Aerospace Corp.'s mission models: "My impression is that the mission models that NASA is projecting for the 1980s are unrealistic. They start at a number that strains credibility and go up from there." The Mathematica report had tried to make such models appear plausible by noting that "the 1964-1969 U.S. traffic equivalent is represented by an annual traffic of 51 Space Shuttle flights." This was close to the 57 flights per year of the baseline mission model. Because a rising tide lifts all boats, NASA's flight rates during the 1960s had been buoyed powerfully by the agency's generous budgets. The OMB had no intention of granting such largesse during the 1970s. In addition to this, the Air Force had flown large numbers of Corona reconnaissance satellites, modest in size. These were about to give way to the much larger Big Bird, which would fly far less frequently. The payload-effects concept amounted to asserting that the Shuttle indeed would meet its cost goals, including cost per flight as low as $4.6 million, and hence would spark a revolution in spacecraft design. The first statement was a speculation; the second then amounted to a speculation that rested on a speculation. Moreover, while payload effects drew strong enthusiasm from a coterie of supporters, this concept flew in the face of the hard-won lessons through which engineers indeed had learned to build reliable spacecraft. NASA's Jet Propulsion Laboratory had a similar experience. This lab had developed after World War II as a center for the Army's battlefield missiles, which did not demand particular care in development. Failure was acceptable in test flights of such missiles because other rounds were readily available for future launches. During the 1950s a new director, William Pickering, redirected the lab as it became a center of expertise in electronics. By 1960, the Jet Propulsion Laboraatory was ready to proceed with Ranger, a series of lunar spacecraft that would carry television cameras to photograph the moon's surface at close range. The program suffered three highly embarrassing failures during 1962, all involving onboard circuitry within the spacecraft. Pickering reshuffled his managers and ordered a standdown that lasted over a year. It didn't work; the next Ranger failed as well. Now the lab was really up against it and heads rolled anew, for everyone understood that another such failure could bring cancellation of the program. Fortunately, the next one indeed succeeded, as did two later ones. This showed that the Jet Propulsion Laboratory indeed had learned to build successful spacecraft. the precision engineering and quality assurance necessary for spacecraft which had to operate nearly perfectly every time. God was in the details - in spotless cleanliness, in thorough testing, and in ruthless follow-up to make sure each failure report was corrected rather than accepted on faith. Such experiences flew in the face of the payload effects concept, which amounted to asserting that spacecraft of the future would resemble stereo systems assembled from components. Yet there also was excellent reason to believe that even if the users of satellites were in a position to do so, they would not want to pursue payload effects. On-orbit refurbishment of spacecraft represented an important aspect of payload effects. NASA's Joseph McGolrick noted that "the users that were contacted indicated no interest in doing that. Usually, what you were talking about was a satellite that was at the end of its life or was partway through its life, and they really didn't want it back. It was, effectively, garbage." Refurbishment on the ground was even less promising: "you're bringing back junk and relaunching, and you've got an extra launch in there to be paid for." Niskanen was one influential skeptic within the OMB; another was Donald Rice. He had served as director of cost analysis within the Office of the Secretary of Defense, at a time when Defense Secretary Robert McNamara viewed cost-benefit analysis as a key to successful procurement and military management. In 1972, Rice left OMB to become president of the Rand Corp. Willis Shapley, a senior NASA official, would later describe Rice's approach to the Space Shuttle: "He was very much enamored of, and very capable in, Rand-style systems analysis. And so he treated this as well he might: as a classic case for a Rand-style study of what system to select." The whole of that company's analysis thus was open to challenge: Shuttle development costs, launch costs, mission models, payload effects. The one point that was beyond challenge was OMB's insistence on a 10 percent discount rate. This was bad news for NASA officials, who had cherished the hope that if only they could present a good justification of the Shuttle on economic grounds, OMB would allow this program to fall into their hands like a ripe pomegranate. Significantly, however, the OMB did not reject the basic premise of NASA and Mathematica: that technical means existed to build a shuttle capable of low-cost and routine access to space. Those means - including rocket engines with long life, onboard systems for automated checkout, and reusable thermal protection - all appeared within reach. Rather, the OMB argued that the Shuttle would cost too much when compared to the benefits it promised, and that those benefits had been overstated. This argument invited a response wherein NASA would seek shuttle designs having lower development costs, which might win the OMB's favor. Such a strategy would carry NASA through the months that lay ahead. Though Apollo was nearing its end and Skylab would soon pass the peak of its funding, NASA had wide-ranging responsibilities in space flight and could not give itself over predominately to the Shuttle. OMB was about to present NASA with a preview of its FY 1973 budget allowances. On May 14, George Low met with Daniel Taft, an OMB staffer who dealt with NASA. Low stated that he viewed annual funding levels of $4.5 to $5 billion as reasonable to expect. This would represent a marked rise from recent levels, with $3.27 billion appropriated in FY 1971 and requested in Nixon's budget for FY 1972. Low, however, was an optimist. Three days later, his hopes received a rude shake. An in-house OMB analysis repeated the findings of the economic review of August 1969: The fully-reusable shuttle would not be cost-effective when compared with the Titan III family. NASA had done its best, using mission models and payload effects to get the answer it wanted in the Mathematica study. The OMB, however, was well aware that economic analysis was certainly not a disinterested exercise seeking demonstrable merit. It was highly political, and the OMB's new in-house study reflected this. NASA had now taken three heavy hits in only a year and a half. The first blow, in the fall of 1969, had come when the BoB had cut the agency's budget request by over a billion dollars. This had forced Tom Paine to abandon his hopes for Mars and to fall back on the Shuttle/station. While this combined  program survived near-death experiences in the House and Senate during 1970, as the budget received new cuts during that summer, Paine chose to emphasize the Shuttle while deferring the space station for the indefinite future. Now, with Rice bringing more bad news, Fletcher saw that even the Shuttle was about to fall, at least as a two-stage fully-reusable design. The Shuttle concept that could fit the budget was nowhere in sight. 1. Astronautics & Aeronautics, May 1969, pp. 32-38; seminar, Department of Aerospace Engineering, University of Michigan, June 15, 1970; Townes, chairman, Report, letter attached. Reprinted in NASA SP-4407, Vol. I, p. 512. 3. Proceedings, NASA Space Shuttle Symposium, October 16-17, 1969, pp. 3-8. 4. NASA TM X-52876, Vol. V, pp. 33-44; Miller, X-Planes, pp. 106-111. 5. Aviation Week, August 31, 1970, p. 38; Astronautics & Aeronautics, January 1964, p. 44; proceedings, NASA Space Shuttle Symposium, October 16-17, 1969, p. 360. 6. Proceedings, NASA Space Shuttle Symposium, October 16-17, 1969, p. 401; AIAA Paper 89-2387; author interview, Paul Castenholz, Ventura, Calif., March 18, 1997. 7. Rocketdyne, Expendable Launch Vehicle Engines; Pocket Data RI/RD87-142 (Rocketdyne), pp. 1-9, 2-15, 2-17, 2-29, 2-31; Lord, Night, p. 103. 8. Author interviews: Robert Biggs, Canoga Park, California, January 21, 1997; Paul Castenholz, Ventura, California, March 18, 1997. 9. Proceedings, NASA Space Shuttle Symposium, October 16-19, 1969, pp. 581-591; NASA TM X-52876, Vol. III, pp. 185-200; AIAA Paper 73-31, pp. 14-15, 35-36; Jenkins, Space Shuttle, pp. 129-131. 10. See Chapter 3 for a more complete description. 11. Mueller, Briefing, 5 May 1969; Heppenheimer, Countdown, p. 254. 12. Astronautics & Aeronautics, July 1968, pp. 42-51; NASA TM X-52876, Vol. V, pp. 1-32; National Journal, April 24, 1971, p. 875. 13. NASA SP-4102, p. 155; NASA SP-4012, Vol. III, p. 61. 14. Letter, Paine to Teague, May 28, 1970. 15. "NASA Space Shuttle Studies" (summary of contracts), April 16, 1971. 16. AIAA Paper 71-806; Standard & Poor's Bond Guide (any month), p. 3; letter, Mayo to Paine, Jan. 20, 1970. 17. Budget Bureau, "NASA Issues Paper," August 1969: attachment, "Space Transportation System," August 22, 1969. 19. Letter, Paine to Shultz, September 1, 1970; U.S. Senate Committee on Aeronautical and Space Sciences, Hearings, FY 1973, pp. 1079-1086. 20. Wyatt, memo, "Cost Effectiveness of the Shuttle," February 12, 1970. 21. Low, Personal Notes No. 16, March 28, 1970; Report LMSC-990594 (Lockheed); Astronautics & Aeronautics, June 1972, pp. 50-58. 22. Letter, Mayo to Paine, March 18, 1970. 23. John Mauer interview, Joseph McGolrick, October 24, 1984, pp. 22-24. 24. National Journal, March 13, 1971, p. 540; August 12, 1972, p. 1292; Report LMSC-A990594 (Lockheed), p. 1-1; Blaug, Economists, pp. 172-174; New York Times, February 13, 1977, Section 3, pp. 1, 9. 25. Low: Personal Notes No. 22, May 16, 1970; No. 23, May 19, 1970; Rocketdyne, Expendable Launch Vehicle Engines; Aviation Week, June 22, 1970, p. 257. 26. Aviation Week, June 22, 1970, p. 96; Jenkins, Space Shuttle, pp. 96-100. 27. "NASA Space Shuttle Studies," summary, April 16, 1971. 28. Press release, White House, November 13, 1969; Low, Personal Notes No. 1, January 1, 1970. 29. Berman, Office, pp. ix-x, Chapter 5; National Journal: March 21, 1970, pp. 620-626; January 23, 1971, pp. 151-165; June 12, 1971, pp. 1235-1244; December 13, 1975, pp. 1690-1691; John Logsdon interview, John Ehrlichman, Santa Fe, New Mexico, May 6, 1983, pp. 17-18. 30. Letters: Shultz to Paine, August 7, 1970; Low to Shultz, September 30, 1970. 32. Low, Personal Notes No. 36, November 28, 1970. 33. Low, Personal Notes No. 37, December 20, 1970; letters: Low to Rice, December 11, 1970; Taft to Rice, December 15, 1970; Rice to Low, December 17, 1970; Niskanen to Rice, December 26, 1970; Taft to Rice, January 8, 1971. 34. Low, statement, January 28, 1971; letter, Shultz to Low, February 19, 1971; Aviation Week: January 25, 1971, p. 13; February 1, 1971, pp. 18-19. 35. Heppenheimer, Countdown, pp. 80, 149, 259; Ramo, Business, p. 102. 36. Memo, Whitehead to Flanigan, February 6, 1971. Reprinted in NASA SP-4407, Vol. II, pp. 50-52. 37. Letter, Mayo to Paine, March 18, 1970; NASA interim report, "Alternate Systems for Reducing the Cost of Payload in Orbit," April 24, 1970; memo, Rhode to Young (OMB), July 23, 1970; NASA report, "Economic Analysis: Alternate Systems for Reducing the Cost of Payloads in Orbit," August 15, 1970; NASA, "Documentation of the Space Shuttle Decision Process," February 4, 1972. 38. Heppenheimer, Countdown, p. 224; Jenkins, Space Shuttle, pp. 86-94; Aviation Week, June 7, 1971, pp. 55-61; AIAA Papers 71-804, 71-805; Reports MDC E0308 (McDonnell Douglas); SD 71-114-1 (North American Rockwell). 39. Report ATR-72 (7231)-1 (Aerospace Corp.); AIAA Paper 71-806; Jenkins, Space Shuttle, p. 125. 40. Reports ATR-72 (7231)-1 (Aerospace Corp.); LMSC-A990556, -A990558 and -A990594 (Lockheed); Astronautics & Aeronautics, June 1972, pp. 50-58; AIAA Paper 73-73. 41. Morgenstern and Heiss, Analysis, May 31, 1971; Astronautics & Aeronautics, October 1971, pp. 50-62; AIAA Paper 71-806. 42. John Mauer interview, Willis Shapley, October 26, 1984, p. 29; National Journal, August 12, 1972, p. 1296; Who's Who in Economics (1986), p. 641; Morgenstern and Heiss, Analysis, May 31, 1971, p. 0-37. 43. Ruffner, ed., Corona, pp. 16-24; Mosley, Dulles, p. 432. 44. Heppenheimer, Countdown, pp. 291-295; Koppes, JPL, p. 164; Time, July 23, 1965, p. 37. See also NASA SP-4210, index references. 45. John Mauer interviews: Joseph McGolrick, October 24, 1984, pp. 34-36; Philip Culbertson, October 29, 1984, p. 15. 46. John Mauer interview, Willis Shapley, October 26, 1984, pp. 29-30; National Journal, January 23, 1971, p. 161; John Logsdon interview, Donald Rice, November 13, 1975, p. 5. 47. National Journal, August 12, 1972, p. 1293. 48. NASA, "Documentation of the Space Shuttle Decision Process," February 4, 1972; Morgenstern and Heiss, Analysis, p. 0-15; AIAA Paper 71-804, p. 19; Report MDC 0308 (McDonnell Douglas), p. 28. 49. NASA, "Documentation of the Space Shuttle Decision Process," February 4, 1972; letter, Rice to Fletcher, May 17, 1971; John Logsdon interview, James Fletcher, September 21, 1977, pp. 8, 15. 50. "Big G" was a proposal for an enlarged Gemini spacecraft carrying up to nine people. 51. Low, Personal Notes No. 47, May 22, 1971.